When extensive rehabilitation training has failed and your dog is still showing signs of aggressive behaviour and is a risk to people and other animals. You need to make time to say goodbye – this includes all family members. You’ll have to explain in advance what will happen so that everyone can be prepared for the loss of their friend. Discuss with your family if you want to make your appointment with your vet at the surgery – or if you’d prefer a home visit vet to carry out the procedure for you. If you choose the surgery take your dog’s bed, pillow, or comfy blanket to offer comfort and security. In-home euthanasia can be easier if your dog is in acute pain or is stressed when visiting the vets. 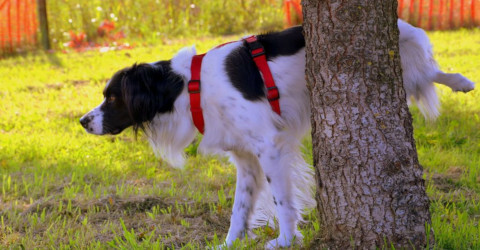 You may also want to give this option further consideration if you have other dogs in your house – as pack animals they can get confused if they see one dog leave the house and not come back – and can search for a long time afterwards. Deciding on whether to be there or not is another factor to consider. It’s a personal choice – can you bear to see your dog’s passing or is it something you simply have to do? You’ll need to think carefully as you may have regrets if you don’t stay – creating a sense of guilt that may be very difficult to come to terms with. However the choice must be your personal preference – your discomfort with death shouldn’t govern your decision. Get a clear focus on what you want to do with your dog after the euthanasia – planning that now will eliminate any stress that may make you hurriedly decide on an option that you later regret. You can choose to have your dog cremated and have the ashes scattered in communal grounds, or have an individual cremation where the ashes are returned to you. Burial is another option – you need to find out if at home burials are legal in your area. Try to settle up your finances in advance as you really don’t want to be making a bill payment after your dog has gone. How exactly is a dog euthanised? Your vet will explain the procedure as it happens – your dog may need an initial sedative if frightened an unable to relax –if your dog is already quiet the sedative may not be needed. The euthanasia medication most commonly used is pentobarbital which is a seizure medication when rendered in large quantities quickly makes your dog unconscious. Your vet must hold a special certificate to purchase the euthanasia solution – the combination of chemicals effect a quick and painless termination alongside complete muscle relaxation. No nerve impulses are conducted ensuring no thought, sensation, or movement. The euthanasia solution is made specifically to act quickly but must be administered through a vein – usually within a few seconds your dog will take a deeper breath and lapse into what looks like a deep sleep. There may be a few more breaths taken before all movement ceases. Within a minute the heart and brain functions are shut down – as your pet passes soiling may occur but this a normal part of the process. Sometimes there are muscle spasms and air sounds as the air leaves the body – but your dog won’t still be alive. After the process your vet will listen to your dog’s heart to confirm death – letting you know that your dog has peacefully passed. You’ll be given time to say goodbye – you can take as long as you like. If you’ve already made your after care and payment arrangements you can just leave when you’re ready. Dog euthanasia at home will be provided by highly qualified vets – and animal lovers from Cloud 9 Vets. The end of life practitioners understand the need to ensure your dog is spared any unnecessary suffering. If your dog is chronically unwell, recently diagnosed with a life-threatening illness, or getting old and uncomfortable, this caring home visit service will take care of your dog and you. Gentle dog euthanasia at home ensures your dog passes peacefully in their own home surrounded by the people and things they love. Your vet will have professional training and qualifications – and years of experience helping families and their dogs. You want to know that your dog won’t feel any pain – putting your dog to sleep at home takes away the pressure of having to go to the surgery and the stress that involves. Your dog will be helped to relax and won’t need a muzzle or an unfriendly approach. The process involves two injections – the first is a slight pinprick to administer a sedative – your dog will drift into a deep sleep within 15 minutes. The second injection is given intravenously through a shaved patch on the front leg or via a catheter into the back leg – your dog simply won’t feel a thing. Caring dog cremation processes can be provided by Cloud 9 Vets – the cremation will take place at the Chapel of Rest. You can opt to be present or let the vets take care of it all for you. When you select individual cremation the ashes will be collected and cooled – before being passed through a cremulator to create a fine ash. You can have the ashes spread in the chapel grounds or returned to you. You can request a certificate of cremation if you would like one. Grief affects everybody differently and there’s no right or wrong way to deal with it. It’s perfectly natural to feel devastated when your dog has been out to sleep – the pain can sometimes be overwhelming and trigger all sorts of difficult emotions. Your dog will have bought you companionship and fun – adding routine to your day and keeping you social and active. The level of grief you experience will depend on your age and personality, as well as the age of your pet and your decision to euthanise. You may feel a profound sense of guilt over your decision but there are healthy ways to come to terms with your loss by talking it through with others sympathetic to what you’ve been through. You need to take care of yourself – losing your dog can cause your physical and emotional reserves to quickly deplete. Try to maintain a normal routine – even more important for young family members and other pets. Get professional help if you need it – if your grief won’t subside and is affecting your everyday life you need to see your doctor or mental health expert to help you with your depression. There are many pet loss and bereavement resources to turn to online – with help and advice to support you during these traumatic times.